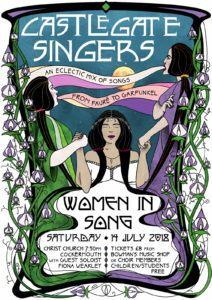 Our Summer Concert – Women in Song was another resounding success. As 2018 was the 100th Anniversary since women won the right to vote, to commemorate the centenary, our summer concert on July 14, included Ethel Smyth’s three-part chorus, The March of the Women. This became the anthem of the women’s suffrage movement, and we are thrilled that our local MP for Workington, Sue Hayman will be guesting with us for this song. Sue is also Chair of the Parliamentary Choir at Westminster.